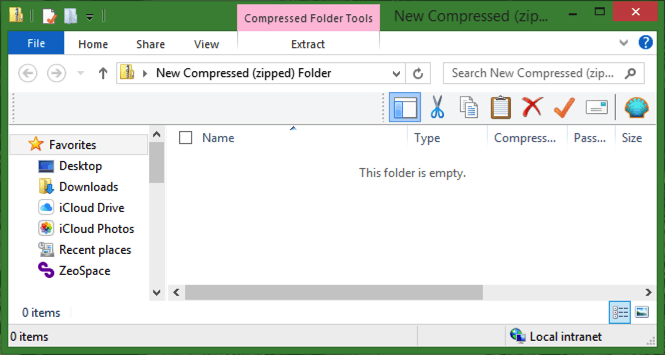 How do I work with a compressed folder in Windows 8? The printing company we work with has requested that we send files to them as compressed (ZIP?) folders. 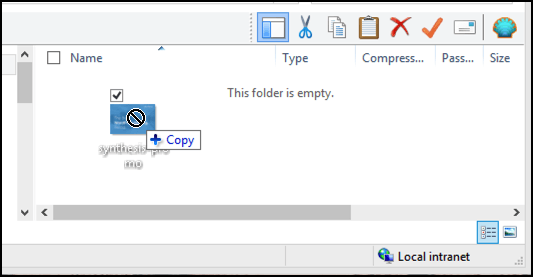 How do I create a compressed folder in Win8? Either you’re working with really, really big files or the printing company is pushing work on you that’s not necessary. Honestly, disk space and even connectivity has meant that file size is less critical than it’s ever been, and the trends are just going to keep moving forward. If they’re really huge, you might even think about a 32GB USB flash drive that you fill up and mail to them, too, but regardless, compressed files are useful but perhaps less than you — and they? — are expecting. In fact, pay close attention to the demo herein, and you’ll see that the various files I use for the demonstration end up compressed only the tiniest bit using the ZIP encoding. But if that’s what they ask for, well, maybe it’s easiest just to go with it. So let’s proceed. 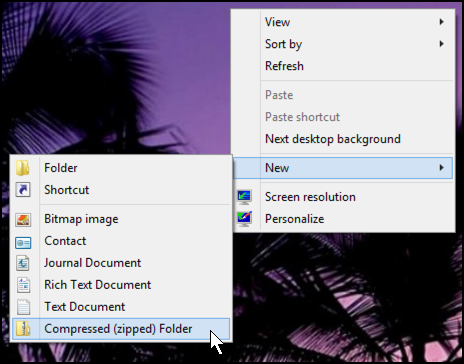 As you can see, you’ll want to simply choose “Compressed (zipped) Folder” from the “New” menu option. Now just drag and drop the files, images, PDF documents, and other content you need to include in the folder. As you can see, we didn’t see much benefit at all from the compression: maybe a total of 2% of overall file size. Different files, different file formats, can yield better results for compression, but overall, a bit disheartening. Hopefully you’ll see better results, however! All four of the files you selected are already compressed media type files. They all have been through some type of codec and have little chance of any further compression. You would have a more noticeable effect if you were trying to compress files such as text, or uncompressed audio files. As I work in the Printing Industry, I might be able to shed some light on this subject as it is less about saving space than it is about ensuring that all relevant files are kept together. What their printing firm would be asking for is for all relevant files (fonts, graphics etc) are saved to a single directory (Adobe InDesign uses Save Package for this function because most software these days use link to file to save space (as embedding creates a huge host file) and the Save Package ensures that all linked files, fonts etc are saved to the same location) . This directory is then Zipped and then uploaded to where ever the printing firm wants the file to go. Basically if a needed file is not in the zipped directory then it is not the Printing Company’s fault if there are problems with the finished job. Yes, I once thought I’d zip some files to try and save a bit of disk space but found that zipping all the files in any one folder made that folder hardly any smaller in size anyway! So I gave up on that idea and bought a bigger hard drive. LOL.